America Needs A Million New Farmers, Veterans Want the Job! 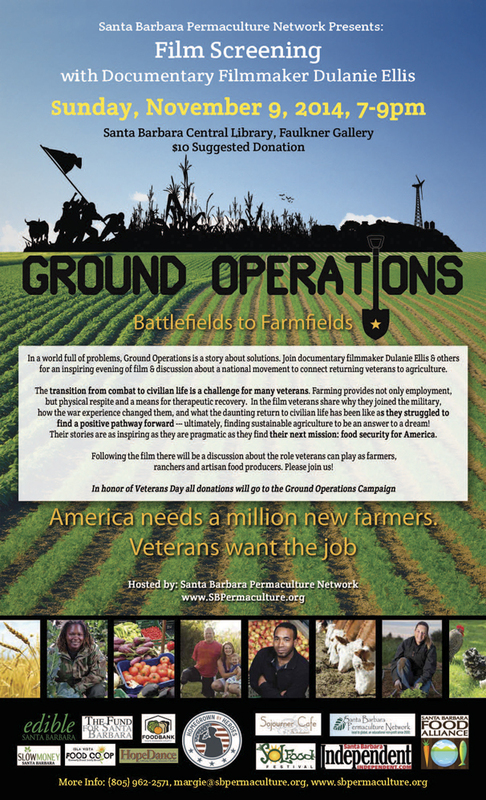 Joined by filmmaker Dulanie Ellis, in honor of the Veteran's Day holiday, Santa Barbara Permaculture Network hosts a film showing of "Ground Operations: Battlefields to Farmfields, a inspiring documentary describing a national movement to connect veterans to agriculture. In a world full of problems, Ground Operations is a story about solutions. The transition from combat to civilian life is a challenge for many veterans. But farming provides not only employment but physical respite and a means for therapeutic recovery. As the U.S. is losing farmers to retirement and the USDA is calling for one million new farmers to fill the gap, can agriculture's problem become our veterans' solution? Farming and ranching offer a place to de-escalate from war. Ground Operations champions a growing number of veterans who are reclaiming their lives with new careers in sustainable agriculture. Sharing why they joined the military, how the war experienced changed them, what the daunting return to civilian life has been, how they struggled to find a positive pathway forward and ultimately, when they found sustainable agriculture to be an answer to a dream. Their stories are as inspiring as they are pragmatic as they find their next mission, food security for America. Following the film, there will be a discussion about the role veterans can play as farmers, ranchers and artisan food producers. Please join us! 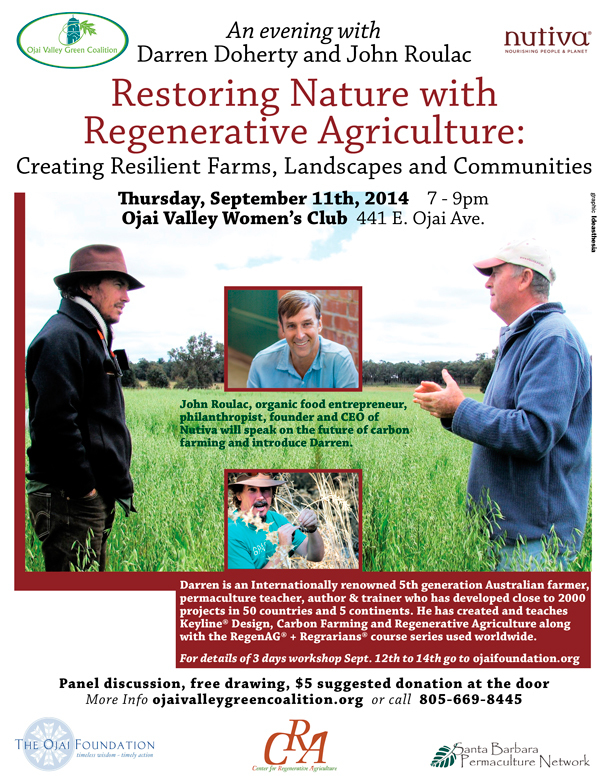 Please join the Ojai Valley Green Coalition, Santa Barbara Permaculture Network & community partners for an evening talk with Australian farmer, author, and internationally recognized leader in regenerative agriculture, Darren Doherty, on Thursday, September 11, 7pm, at the Ojai's Women's Club in Ojai. Part of the 2014 Regrarians World Tour, Darren Doherty shares his vision of restoring degraded agriculture and other broadacre landscapes found across the USA and other parts of the world with regenerative strategies for soil creation, water harvesting, and most exciting, capturing atmospheric carbon dioxide (carbon sequestration) to help address global climate change, using the microbiology of healthy soils. Regrarians (Regrarians = Regenerative Agrarians) is a term coined by Darren to describe the serious and timely process of regenerating, restoring, rehabilitating, rekindling and rebooting healthy production landscapes across the planet. And not a moment too soon, with California currently facing serious issues of drought, severe soil loss, polluted waters, and potentially devastating wildfires; all needing innovative solutions. Darren Doherty has extensive experience across the world in project design, development, management & training. A career-long focus on the profitable & regenerative retrofit of broadacre landscapes has seen Darren acclaimed as a pioneer in this important field. He is an internationally renowned fifth generation farmer, permaculture teacher, author and trainer who has developed close to two thousand projects in fifty countries and five continents. He created and teaches Keyline Design®, Carbon Farming, Regenerative Agriculture, along with the RegenAG® + Regrarians® course series currently used world wide. 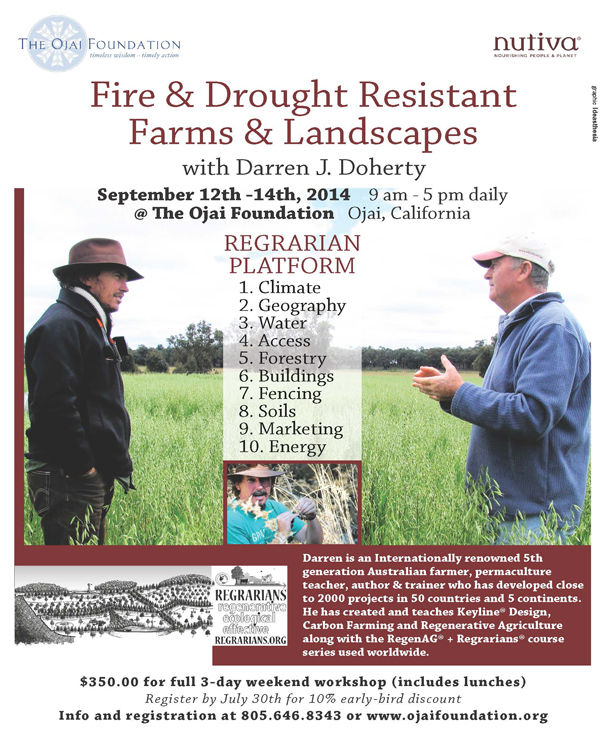 A panel discussion will follow the talk, facilitated by Leif Skogberg of the Ojai Foundation, who will host a 3 day Regrarian Workshop with Darren Doherty Sept 12th-14th. Ojai is pleased to host Darren J. Doherty and his Regrarians 2014 World Tour for this regenerative agriculture professional development course ideal for broad-acre land professionals, including: farmers; ranchers; property and preserve managers; rural landscapers; real estate agencies; land-use planners; developers; and anyone else involved in and interested in learning more about the care and stewardship of large farms, properties and communities in Central and Southern California. This Regrarians Open Consultancy & Practicum Design Workshop is a dynamic 3-day program designed to involve participants directly in the delivery of an integrated farm and property planning and development consultancy. Led by one of the world's most renowned & experienced farm planners, Darren J. Doherty (AU), this course is all about having participants work to understand the 10 step process logic involved with the Regrarians Platform which methodically covers each and every element of farm planning and development. In short, this course will be a highly useful and functional Professional Development (PD) for primary producers & land managers when it comes to production landscapes, enterprise planning & site development. The RAC+RAD experience will result in participants understanding some of the process behind re-booting their own farming enterprises with an opportunity for feedback based on their own unique and specific site challenges. This course also offers a step by step approach that is highly adaptable to any site and circumstances. The Ojai Foundation is an educational camp, retreat and non-profit organization, that is proud to present this unique program to the Ojai and Southern California communities in order for us to learn more about advanced farm and property design from one of the world's leading designers geared specifically to current California drought limitations and challenges. Given the extreme conditions, this course will have a unique focus on integrated designs for fire and drought resistant farms and landscapes, as well as how to create productive and resilient local land-based farms, neighborhoods and communities. With extreme drought, water shortages and warnings of severe fire danger this summer, along with all-too-common soil degradation practices used throughout the agricultural world, this course aims to empower property managers, ranchers, landscapers, farmers and developers with firsthand knowledge and experience of how to reverse desertification, soil loss, salt build-up, weed invasion and more common agricultural and ranch problems with integrated and holistic land-use planning and design, which can positively transform terrestrial ecosystems. This open consultation course will go through the Regrarian Platform and site design process providing an integrated vision for the future of the course site. Although rooted in biodynamic farming and regenerative design in the early days (late 70's), the course site is not currently a production farm or ranch, but has hosted many Permaculture courses and is covered by a great deal of healthy native ecosystems, planted with many edible fruit trees and is located on a forested seasonal desert ridge at an elevation of between 1400 and 1800 feet above sea level. The site also has over 20 acres of viable orchard, pasture and/or grazing land, which is currently being explored for production and best management. What will be the best option for this site? What is the best design and management for your site?" This Upper Ojai Valley site is adjacent to hundreds of acres of farm land, as well as wilderness and open space, which allows us a prime perspective to contemplate and explore with Doherty best practices in a variety of Ojai orchard crops, pasture lands and native ecosystems. Participants will have the opportunity to learn and use Darren Doherty's Regrarian Platform, through this real-project "Open Site Consultation". Participants will also work in practicum groups and analyze their own individual land management challenges with potential solutions offered by Darren and others. The practicum will explore real-live local needs and offer practices and approaches towards better production rates and overall land resilience. Program includes a field workshop focused on understanding integrated water systems design to maximize water retention, use and efficiency as well as how to find the "keypoint and keyline" for building water harvesting earthworks, pattern cultivation and Keyline plowing systems, among others. In summary, this course will explore integrated and holistic site design, planning and management practices and how to place the various elements of human settlement, including infrastructure, as well as productive systems of grazing, orchard crops, pasture, and forestry in an arid Mediterranean climate. See more on Darren Doherty's Regrarian Platform below. RAC = Regrarians Open Consultation Course (Friday and Saturday) – This RAC will be a two day professional development workshop in which attendees witness and experience an "open" consultation on a real-life project and in so doing become exposed to the practical application of Regrarians Platform and this unique integrated design process as outlined by Darren Doherty in his forthcoming book, "The Regrarian Handbook." RAP = Regrarians Practicum (Sunday) – This RAP will be a one day project practicum and Keyline Design workshop, which will be experiential and project development-based where participants are involved in the process of implementing Regrarian systems. RAP's are for anybody who wants to build their physical skills, knowledge and experience as part of a regenerative land management and integrated production system toolkit. This RAC will be for integrated water and soil systems design, including Keyline Design and Pattern Cultivation. Darren J. Doherty is a 5th generation Australian-Bendigo farmer, developer, author & trainer who has delivered over 190 Regenerative Agriculture & Living courses & seminars to more than 12,000 people since 2001, including more than 40 Permaculture Design Courses (PDC's), as well as creating Keyline® Design, Carbon Farming, Carbon Economy, RegenAG® & Regrarians® course series across Europe, the Americas and Oceania. Darren has also completed nearly 2000 property development plans since 1993 in 47 countries and is widely recognized as a leader & pioneer in the Regenerative Agriculture & Permaculture movements. Darren has extensive experience across the world in project design, development, management & training. A career-long focus on the profitable & regenerative retrofit of broad-acre landscapes has seen Darren acclaimed as a pioneer in this important & often overlooked field. This wide experience has created an international reputation of achievement plus enviable & expansive networks that integrate many disciplines. Globally many of Darren's alumni of over 12,000 are at the cutting edge of the movement towards regenerative agriculture & living systems. Darren is the originator of the Regrarian Platform, which outlines a strategic & logical process to the development of regenerative agricultural systems, central to which is another Doherty innovation, called 'IntegriPasture', which provides an integrated framework for multiple species pasture and localized processing, logistics and marketing. Regrarian, a portmanteau of "Regenerative Agrarian", is a term first coined by Darren J. Doherty in 2013 to describe those who are actively undertaking the serious & timely process of regenerating, restoring, rehabilitating, rehabitating, rekindling (etc.!) & rebooting healthy production landscapes across this planet. This very first North American Permaculture Convergence offers a special opportunity to meet up to 1,000 permaculture movers and shakers from across North America to share our successes and strategize how to create a permaculture future. Permaculture pioneers, authors, teachers, organizers, consultants, visionaries and farmers getting together to talk story and build symbiotic relationships. EVERY PERMACULTURIST IN NORTH AMERICA IS INVITED!Old and young, Experienced and novice. The NAPC is a historic moment. It marks the cusp of a new era, the turning of the wheel, the passing of the guard. Be a part of this historic event. This is a meeting of the minds. This is a gathering of the experts. 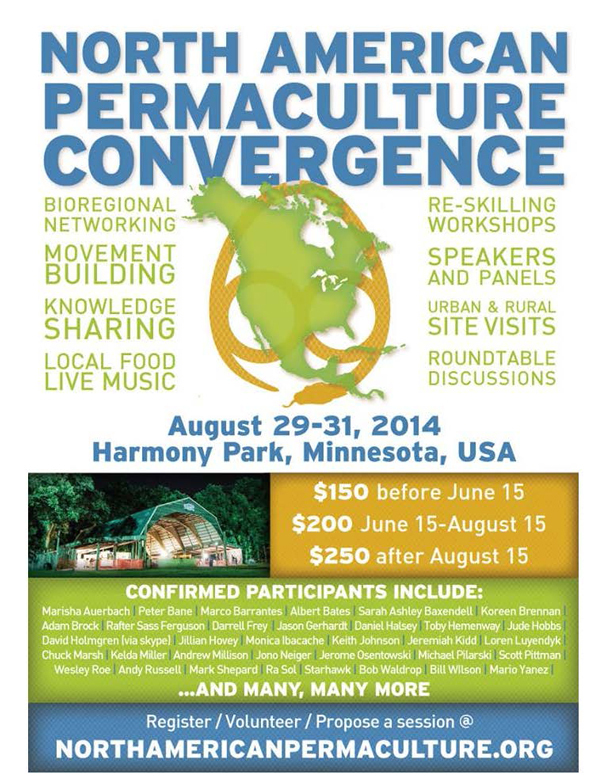 A permaculture convergence is traditionally just for permaculture design course graduates. NAPC's main audience is practicing permaculturists, but we willing to take registrations from interested people who are non-pdc grads. One of the goals of NAPC is to bring together the long-term, old-growth, hard-core permies. We expect that half of the participants will be fully capable of teaching permaculture. This is a convocation where we are all talking and sharing together. It will be exciting! Long-time permaculture pioneers are especially invited. We'd like to hear some of your accumulated knowledge and wisdom. We'd like to sit with you, reminisce about the spread of permaculture in North America, and discuss our best strategies going into the future. The permaculture pioneers aren't retiring from permaculture. Permaculture is a lifestyle, a way of life founded on our three ethics. We suspect many of the permaculture pioneers will die with their boots on; doing their best to make a difference. The presentations will be divided into 3 tracks . . . Anyone can schedule a presentation. WE expect and encourage a wave of proposals for presentations, round-table groups, etc. The NAPC program committee will have to keep track of all of them and categorize them, look for duplicates, and assist them to happen in an orderly manner. If you'd like to put something on the schedule, fill out the form in the Program menu. NAPC as an egalitarian community. We view the NAPC event as a gathering of the tribe. A meeting of a peer group. We value everyone's input and participation. Come because you are excited about participating. Everyone has something to share. We are all part of the permaculture community.NAPC is taking an egalitarian stance when it comes to presenters and speakers. As this is a peer group event, we are asking everyone to pay their share of the NAPC expenses.With the exception of 1) those core group organizers who are putting in hundreds of hours to pull this off. 2) Work-trade people who put in significant extra hours doing the nitty-gritty work of the day. 3) People awarded scholarships because of their great work in disadvantaged communities and demanding situations.Gatherings and festivals are one of the most important parts of being human. Particularly when it is a gathering of your own "culture" or subculture. You feel safe there and belong. People from the same profession getting together is inspiring, empowering and offers a way to exchange information and make connections that can never be achieved via internet or technology. Convergence: what does it mean? the degree or point at which lines, objects, etc., converge. the merging of distinct technologies, industries, or devices into a unified whole. to tend to meet in a point or line; incline toward each other, as lines that are not parallel. The act, condition, quality, or fact of converging. Mathematics The property or manner of approaching a limit, such as a point, line, function, or value. Synonyms: concurrence, confluence, meeting, merging, congress, appulse, resort (focus), asymptote, concourse, concentration, coradiation, conflux, convergency, assemblage. Use our Facebook group page at to arrange to share rooms, RVs, etc! Camping – If you are purchasing a full weekend pass we welcome you to build community with us by camping on-site at no extra cost. Campsites are rustic with no hook-ups, a short walk from bathrooms and water. Bring your own camping supplies. Please arrive and set up your campsite before dark. A limited number of RV spaces are available for an additional cost. If you do not want to camp, there are a number of motels nearby. Please see the comprehensive list below. Shower Building – The shower building has ten pay stalls that feature on-demand hot showers. Firewood – Firewood is available for purchase on site. In order to protect the natural surroundings from tree-borne disease, we request that no off-site wood is brought in. Lake – Harmony Park is surrounded on 3 sides by Geneva Lake. While this a shallow lake that is managed for wildlife, there are places where someone can slip into the water for a cooling dip. The use of soap and shampoo are not permitted. Playground – In 2009 Harmony Park saw the addition of a state-of-the-art playground by Rainbow Play Systems. We will provide additional children's activities throughout the weekend. There are many lodging options in Albert Lea, which is just 15 minutes from the NAPC. 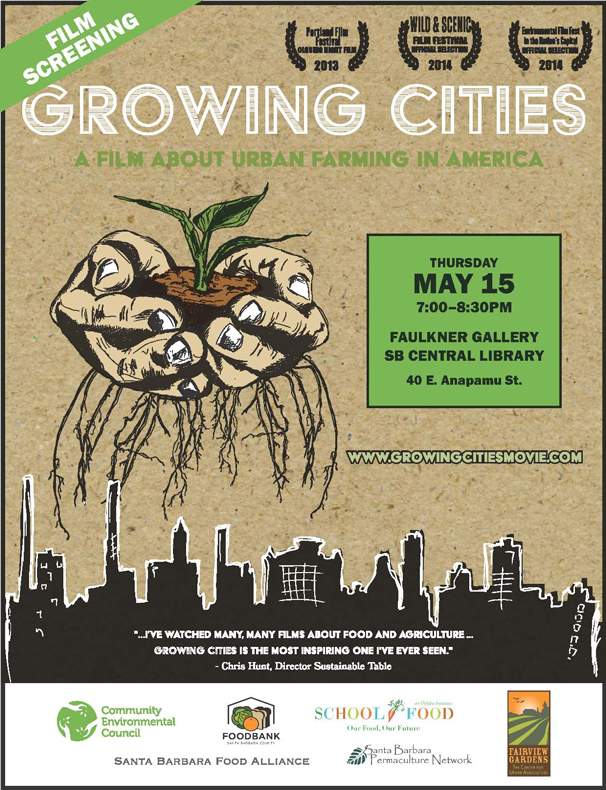 Growing Cities is an inspiring documentary about urban farming in America. At a time when so much negative attention is paid to the food system, this film tells the stories of city-dwellers who are transforming their communities--one vacant lot, backyard beehive, and rooftop farm at a time. Sponsors: Community Environmental Council, Food Bank of Santa Barbara County, Orfalea Foundation’s School Food Initiative, Santa Barbara Food Alliance, Santa Barbara Permaculture Network, and the Center for Urban Agriculture at Fairview Gardens. Community sponsors of the film will be available after the screening to answer questions about urban farming, community gardens, access to healthy food, and more. These sponsors represents a network of community groups who work to improve SB County’s food system: the Community Environmental Council (which addresses pressing environmental issues and encourages people to eat local food); the Food Bank of Santa Barbara County (which is ending hunger and changing the health of Santa Barbara County); the Orfalea Foundation’s School Food Initiative (which empowers school districts to offer nourishing school meals); the Santa Barbara Food Alliance- (which advocates for a resilient, local food system); the Santa Barbara Permaculture Network (ongoing events & programs for the community featuring sustainability & permaculture); and the Center for Urban Agriculture at Fairview Gardens (an educational farm that offers cooking and gardening classes). Many film festivals included this film in their selection for 2014, including: Wild and Scenic, Portland Film Festival, Flagstaff Mountain Film Festival, Princeton Film Festival, and more. 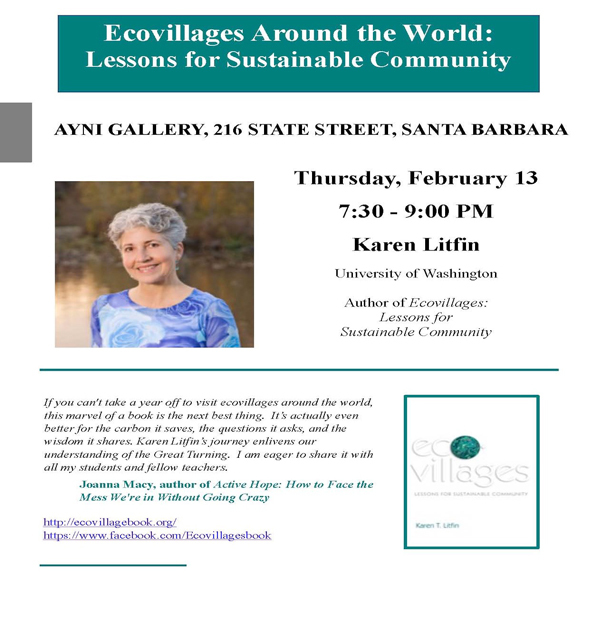 Join author Karin Litfin as she shares her newly published book "Ecovillages: Lessons for Sustainable Community", in an evening talk on Thursday, February 13, describing her experiences traveling and visiting Ecovillages around the world. In a world of dwindling natural resources and mounting environmental crisis, who is devising ways of living that will work for the long haul? And how can we, as individuals, make a difference? To answer these fundamental questions, Professor Karen Litfin embarked upon a journey to many of the world's ecovillages -- intentional communities at the cutting-edge of sustainable living. From rural to urban, high tech to low tech, spiritual to secular, she discovered an under-the-radar global movement making positive and radical changes from the ground up. Not only is another world possible, it is already being born in small pockets the world over. These micro-societies, however, are small and time is short. Fortunately -- as Litfin persuasively argues -- their successes can be applied to existing social structures, from the local to the global scale, providing sustainable ways of living for generations to come. WHAT IS AN ECOVILLAGE? The Global Ecovillage Network defines an ecovillage as an intentional or traditional community using local participatory processes to holistically integrate ecological, economic, social, and cultural dimensions of sustainability in order to regenerate social and natural environments. Because any group can call itself an ecovillage, the term has been adopted by entities ranging from student coops to suburban housing developments. In order to have an authentic experience of ecovillage life, Karen chose to visit larger, more established communities belonging to the Global Ecovillage Network. Karen also selected for diversity in order to experience the full range of ecovillage culture: rural, urban and suburban; rich and poor; secular and spiritual. Starting with Earthhaven on the east coast of the US, Karen worked her way around the world via Europe, Africa, Asia, and Australia, concluding her journey in Los Angeles nine months later. Auroville India, Colufif A Senegal; Crystal Waters Australia; Damanhur Italy; Earthaven North Carolina USA; EV-Ithaca, New York USA; Findhorn Scotland; Konohana Japan; Los Angeles, California USA; Sarvodaya Sri Lanka; Sieben Linden Germany; Svanholm Denmark; UFA-Fabrik Germany; & Zegg Germany. Karen Litfin is a professor of political science and environmental studies at the University of Washington. She grew up in Pittsburgh and Baltimore, received a B.A. and M.A. from University of Maryland, and then a Ph.D. from UCLA. Karen is a mother, an introspective activist, an avid bicyclist and hiker, and a second-rate gardener. In her research and teaching, Karen takes a "person/planet politics" approach, which entails integrating the intellectual, emotional, practical and contemplative dimensions of sustainability. Karen's first two books were Ozone Discourses: Science and Politics in Global Environmental Cooperation (Columbia University Press, 1994) and The Greening of Sovereignty in World Politics (MIT Press, 1998). YouTube/Seed Communities: Ecovillage Experiments Around the World with Karen t Litkin. 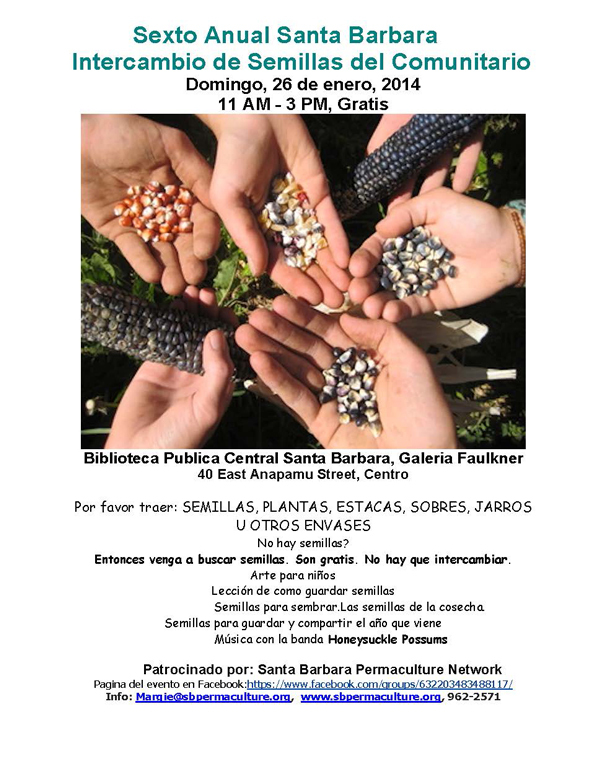 "Modern Science Meets Ancient Maize"
Join Santa Barbara Permaculture Network as it hosts the 6th Annual Santa Barbara Community Seed Swap, with two events. 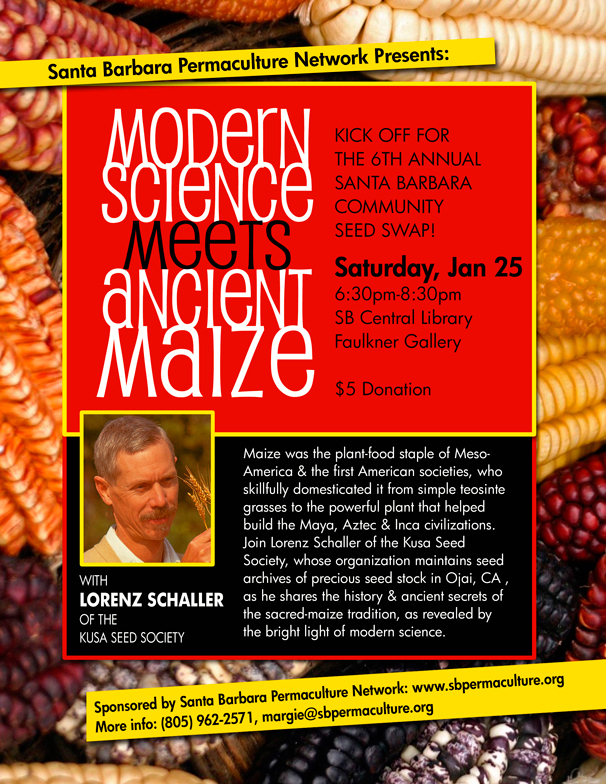 With a theme of plants from the Western Hemisphere & Mesoamerica this year, the event kicks off with an evening talk by Lorenz Schaller of the Kusa Seed Society, titled "Modern Science Meets Ancient Maize". Maize was the plant-food staple of Mesoamerica and the first American societies. Domesticated from teosinte grasses in Southern Mexico, Maize was the staple grain of the Aztec empire. 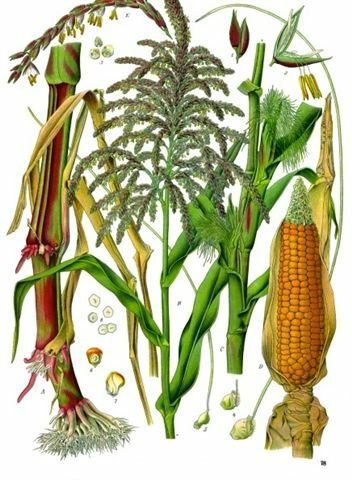 Ancient Mayans had over 300 Maize foods, while the Incas, an advanced agricultural civilization that skillfully developed an amazing variety of plants like quinoa, beans, amaranth and potatoes, prized Maize above all others as the plant that nourished and allowed their civilization to rise and thrive. In his evening talk, Lorenz Schaller will share the history and some of the ancient secrets of the sacred-maize tradition, "as revealed by the bright light of modern science in the fields of human nutrition, cereal chemistry, and holistic health & well being". Please join us for an enlightening evening! 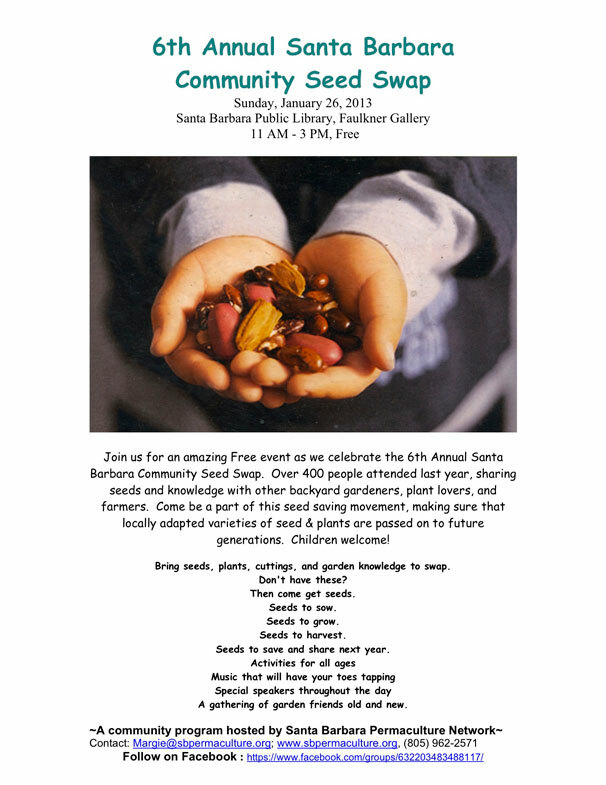 Continuing on Sunday, January 26, the 6th Annual Community Seed Swap takes place, and also encourages a look at seeds and plant stuffs from the Western Hemisphere. Please come and share your examples of plants from the Americas like squash, corn, chayote, potatoes, beans, tomatoes, avocados, guavas, chili peppers, manioc, agave, and prickly pear. A truly rich heritage, a gift from our skilled ancient ancestors, may we steward their legacy with care. But as always all seeds, especially locally grown seeds, are welcome. More than 400 people attended the Seed Swap last year, sharing seeds and knowledge with other backyard gardeners, plant lovers, and farmers. Come be a part of this seed saving movement, making sure that locally adapted varieties of seed & plants are passed on to future generations. Children are welcome!